You know who looked crazy dapper at the Tonys on Sunday? Hugh Jackman. He rocked slicked back hair and a full beard with a tux, and made it look sensational. But as you can see from the shot he shared above, his thick head of hair has been sacrificed for his upcoming role in Pan. 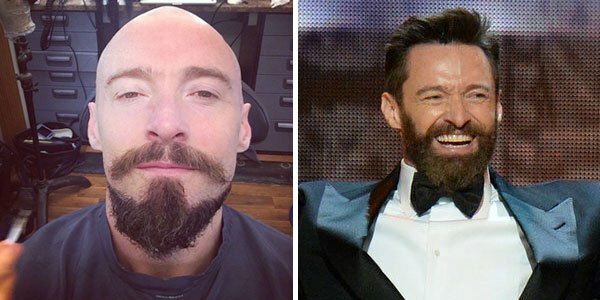 Hugh Jackman shared this image on his Instagram, giving us all a first look at his Blackbeard--as in the character he plays in Pan, not his literal black beard. Warner Bros. is producing Pan, a gritty re-imagining of J.M. Barrie's Peter Pan. This family-friendly adventure will be angling for the same audiences that made Alice In Wonderland and Maleficent such formidable hits, but earning this commercial pic some prestige is director Joe Wright. Best-known for bringing to life dense novels like Atonement, Pride & Prejudice and Anna Karenina with opulent, poignant and acclaimed movie adaptations, Wright's Pan is already earning award season buzz as production kicks off. The screenplay by Jason Fuchs has na orphan called Peter Pan being spirited away to the wondrous world of Neverland, where he meets Indian princesses, fairies, and pirates. Hugh Jackman is slated to play the pirate Blackbeard, but before you rush to thinking that's a re-imagined Hook, let me assure that role has gone to Tron: Legacy star Garrett Hedlund. Also on board is Rooney Mara, Wright's controversial pick for Tiger Lily, newcomer Levi Miller as Peter Pan, Game of Thrones' Nonso Anozie as a character called Bishop, and the recently added Amanda Seyfried as Mary Darling. Notably, this not the only Peter Pan re-imagining in the works. Disney is developing a movie version of the successful Broadway musical Peter and the Starcatchers, which has Peter teaming up with the titular star catchers--a girl called Molly--to defeat the power-hungry pirate known as Black Stache. A Peter Pan origin story is being produced by Channing Tatum once titled Peter Pan Begins. And a third revamp on Peter Pan was teased back in 2011. Also called Pan, this version lined up Aaron Eckhart as Captain Hook, who is this case is a police captain tracking a deadly childlike killer. Guillermo del Toro was involved, and AnnaSophia Robb was on board as Wendy, who teams up with hook to bring down the killer Pan. Audiences could have been poised for Peter Pan overload, but Wright's Pan is the only one of the four that is ready for production. Joe Wright's Pan is set to fly into theaters on July 17th, 2015. The rest are still waiting on fairy dust.